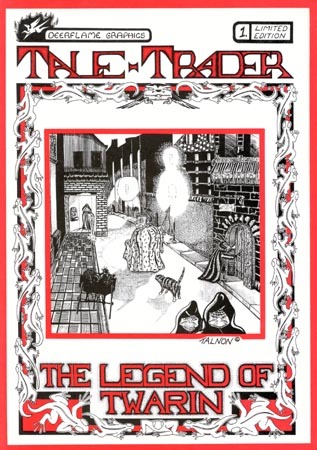 Although Tale-Trader was my very first published graphic novel, it was not the first story I had planned to write. T-T was sort of born out of necessity, specifically created to help someone in a way that mere words of truth could not. But more on that later. Tale-Trader started life (as is often the case with many people) as a simple idea in the shower. This idea blossomed into a quick sketch and shortly after an entire story began to unfold. Being unsure just what format to use to tell my tale, I produced 42 detailed pen and ink illustrations of the major stages of the story. At first it was suggested that I collect the works as a set of calendars -- but then how would anyone know the actual story? So I wrote a text story to accompany each illustration and decided to try my luck with publishers. I sent out the usual introductory page explaining who I am, the synopsis of the story and a portion of the actual book. It didn't take long for the rejections to come poring in -- publishers being quite distressed that the main characters (and indeed everyone in the book) were not human! It seems that they would have considered me with more interest if I had just 'humanised' the story, taken it out of its unusual fantasy setting and set it in a more 'modern' time. Of course publishers never really understand just what it is they're asking a writer/artist to do since more often than not they have no idea the amount of time, effort and passion that goes into a book of this nature, (especially if there is just one creator). So after all those disappointments, I decided against creating just another illustrated fantasy that would most likely have become lost in the sea of picture books already published each year. Then I remembered my love for the amazing comic book Elfquest. When I first discovered Wendy Pini's masterpiece Elfquest, I remember the experience hitting me like a bolt of lighting. I never realized just what a powerful medium comics could be. When I was young, I had occasionally read other comics but soon lost interest because they lacked a certain grandness, But Elfquest had an epic quality that made you want to see it through, a quality that gave it a real reason to exist. This was by no means 'simple entertainment!'. Anyway, you get the picture. For me it was one of those life-altering moments. Although I'd always written stories and had a multitude of weird and amazing creatures living in my head, I'd never really thought about what sort of medium to use to best bring them to life. Elfquest changed all that. So I embarked on the long, time-consuming task of bridging my 42 illustrations with just as detailed comic book pages. You could say it was my first adventure into comic illustration. (I've learned a lot since then!) It was hard but I loved every minute of it. It gave me a true sense of freedom as a creator that I had never felt before. I was creating a 'movie' in its simplest essence. And it was thrilling! Experimenting with angles, timing, expressions, etc pushed my learning curve up a notch, and although today I can say I'm quite happy to be a lot better now, for a first effort, it's not too bad at all! After a couple of years, my bridging pages were complete and the entire 119 story was at an end. Of course for me, it was just the beginning. I decided against trying publishers again, as there was no publisher in Australia that was willing to give comics a go. Why not do it all myself? (Naïve, brave words of the inexperienced!) I guess I was trying to prove to myself that taking a risk is better than not taking one at all, especially where learning is concerned -- and I also wanted to show that particular person to whom the book is actually about, just what you can accomplish when you put your mind to it -- that you can feel good about yourself, you can be proud of what you achieve. So I hunted around for a decent (insert word 'cheap' here!) printer, who would do a good job with quality paper and binding. I found one (after heaps of quotes) and the job began. I guess I was lucky -- they listened to what I required and let me check in on their progress every so often. But little did I know, time for me ran out -- the person to whom I was to proudly give the book, to show of my concern for him and the path his life was taking, died the day Tale-Trader came back from the printers. The irony is that they specifically waited that extra day to ask me if there was any last minute additions I wanted included. Not much I could do about that -- so I used the opportunity to say goodbye to him. I can't even begin to count the number of 'what ifs' that went through my mind at that time, and the constant, haunting question, would things be different if that one event, the receiving of a simple gift, had occurred on the time it was meant to? So boxes and boxes of books were now in my possession. Smooth sailing? Hardly! I quickly discovered that about 20% of them were faulty -- pages missing, upside down... you name it, it happened. And how do you think I discovered this? By going through each and every single book, checking every single page. A nightmare! There was no way I'd allow a work of mine to be sold and read if there was the slightest chance it was faulty. What's the saying -- you are your hardest task master?! So I sent the faulty ones back and they were reprinted. At least that wasn't too big a hassle (of course they wanted more money, and of course they didn't get it!). Next came distribution and advertising. Since my target audience was high school students (and the young at heart, especially those who enjoy books like Lord of The Rings, The Wizard of Oz, etc) and specialist book shops, I got in touch with union magazines for reviews, librarians, teachers and friends in the profession. I even entered it into as many children's book award contests as I could. (I didn't win, but the kind help given to me by people who had faith in what I was trying to do more than made up for it). Many of my sales were because of people who knew people who could do me favours..., such as include advertising in their magazines and fliers. If I had to do this all myself, it would have cost a small fortune on printing, postage, phoning etc. Sales overall weren't too bad and I came close to recovering initial printing costs. I guess I had hoped for better results, especially from book shops who would consistently hide them in obscure places, many refusing to return unsold copies or claiming they were stolen, and many refusing to even give it a chance on their shelves, claiming there was no market whatsoever for 'comics'. I guess an actual distributor would have made things a lot easier... except that their percentage of the RRP would have meant I would actually be paying them to sell the books! (But that's a whole other story!) So mail order has pretty much been my main platform for sales. It's slow, but it's also nice when people, out of nowhere, order a copy and tell me how much they enjoyed it, wishing there were books like it in the shops. Who knows, maybe one day books like mine will be accepted -- not just as light entertainment, but as an important part of the literary world. Oh, and by the way, I still have some copies left for sale!